Standard and non-standard threads can be cut on capstan and turret lathe. All types of standard threads can be cut on this machine with the help of collapsible taps and self-opening die heads. These machines are developed mainly for production work. So most of the jobs produced contain standard threads. Single point cutting tools are also used for thread cutting on capstan and turret lathes. These are used in conjunction with leaders and followers. These are used to cut a special or large diameter screws (non standard) thread only. 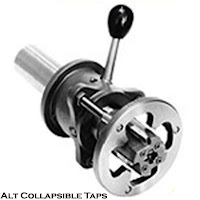 (a) Collapsible Tap - Threads of large diameter are not generally cut with solid tap but with collapsible tap. This consists of a body with slots for carrying the blades. Inside the body there is a plunger with a taper on the end of which supports the blades in their operating position. A trip ring, which may be set at a suitable longitudinal position, is connected to inner plunger and the action of this ring arrests the inner plunger whilst the blade and body moves forward. This removes the taper support from the blade bases allowing them to collapse so that the tap may be withdrawn without stopping or reversing the machine. It is used when the diameter exceeds 1”. The range is 1 ¼ to 3 ¾” inches. Five standard tap bodies and 33 standard tap heads enable ALT taps to produce 1-1/4" to 13-1/4" I.D. and 1-1/4" to 12" nominal NPT and BSTP pipe threads. Recommended where wide range of work requires the versatility and wide range coverage offered by detachable tap heads. A receding chaser type tap primarily intended to produce longer length American Petroleum Institute (API) threads. Can also be used to cut NPT and BSTP taper pipe as well as straight threads. Four bodies with 26 standard tap heads allow 1" to 12" nominal pipe sizes to be tapped. A receding chaser type tap for use where overall length restrictions prevent the use of the longer LL Tap. The 2 LLSR's overall length is 10-1/16" regardless of the tap head size used. The 2 LLSR tap body can be supplied with 1-1/4", 1-1/2", and 2" size heads to produce threads on 1-1/4", 1-1/2", and 2" NPT, BSTP, and API line pipe, without chaser leave-off marks. 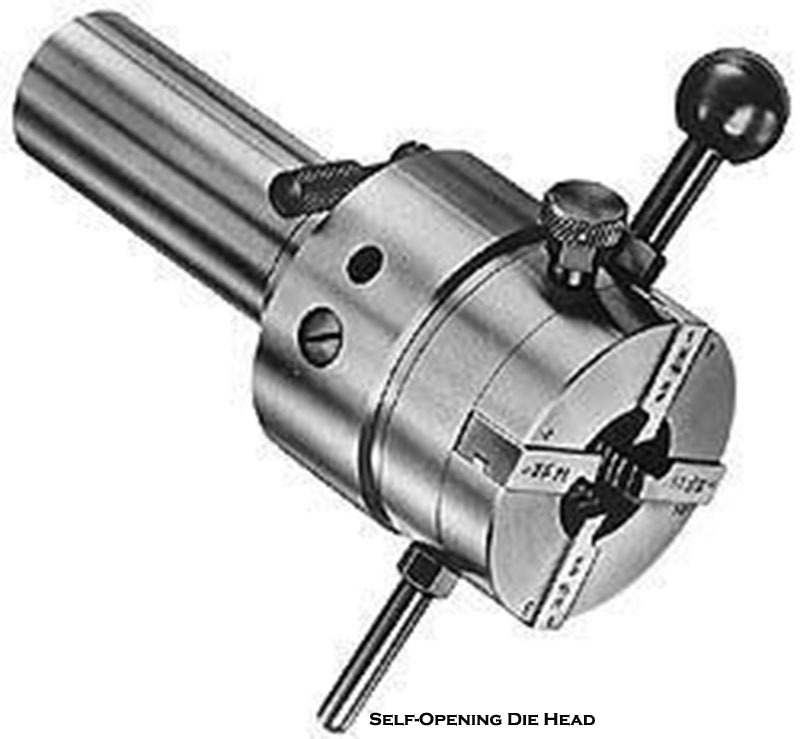 (b) Self-Opening Die Head and Dies - This attachment is capable of holding the standard dies in position and is used to machine external standard threads. Figure below shows Self-Opening Die Head. Dies may be fitted in self opening type of holders. The self-opening type die holder is used for cutting an exact length of thread, and where quick removal of die head is necessary to reduce the production time. When the desired length of thread has been cut, the die head opens, thus clearing the die pieces from the thread and permitting the die head to be withdrawn without stopping or reversing the spindle rotation. The die pieces are four in number for a particular dimension, which are fixed in die head slots provided for them consecutively in clockwise direction. Particular care should be taken in selecting the die pieces size, serial number and the type of thread. In operation the head is partially rotated to close the dies and then fed on to the work end with a light pressure. The range of dies pieces available is ¼” to 4 ½” diameters. The following table shows the recommended cutting speeds in feet per minute for die heads. Leaders and Followers - Most the screw cutting on these machines is accomplished by means of taps and dies. But where large or non-standard screws are required to be made, it is not possible to cut with the tap or die. In such cases leaders and followers are used. The leader is a short lead screw and the follower consists of two bronze half nuts which are held firmly in place by cam. Cam is operated by a light pressure on a conveniently located hand lever.